The battery capacity should be at least five times as large as the rated power of the inverter divided by the rated voltage of the battery. In contrast to so-called square wave or trapezoidal­ inverters (grey square curve), Steca sine wave inverters produce a real and precisely controlled sine wave (red sine wave) at their output. The sine wave inverters assure that all loads which are suitable for grid operation can also be operated on a solar home system without any problems. Furthermore, they offer the advantage that no significant noises are produced in the inverter and there is no loud background noise to be heard on a connected radio, for example. The power of the inverter must be selected according to the way it will be used. 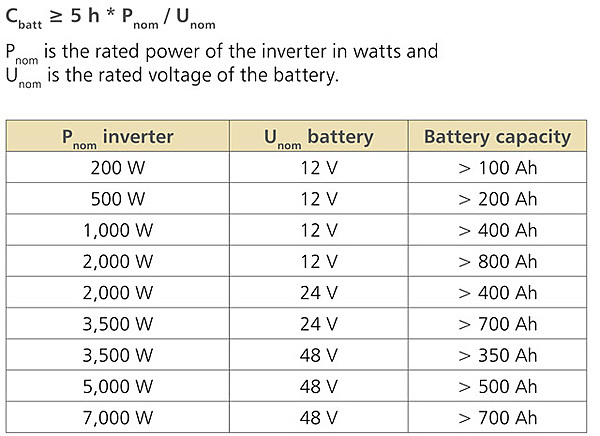 The sum of the power of all loads must not exceed the rated power of the inverter. The maximum power of the inverter must be able to cover the starting currents of the loads. In order to allow the connection of more loads, ­Steca recommends overdimensioning the inverter. The solar module array has to be adjusted to the local sunlight conditions and the system‘s energy requirement. In order to avoid stagnation times, the PV generator must also provide enough power during months with little solar radiation in order to cover the requirement of the connected loads. The chosen solar charge controller must also be suitable for the maximum short-circuit current of the PV generator and the maximum load current. In some applications, however, technical properties also play an important role in the choice of solar charge controller. This may mean that a high-performance solar charge controller with corresponding additional functions is used in a system with a low output. In order to keep the initial investment small, we recommend planning the size of the PV generator and battery according to the current energy consumption and choosing a solar charge controller which will allow the system to be expanded later. In order to also be able to supply loads with high requirements without any problems, the size of the battery must be chosen with care. Some critical loads such as fridges, freezers, pumps and motors need extremely high starting currents in their start-up phases. In order to be able to power such loads, it is important to use a high-performance inverter with a high overload capacity, particularly in the start-up phase. The battery must also possess a large enough capacity so that sufficient currents are made available to the inverter in the start-up phase. We recommend choosing the battery size according to the following formula: the battery capacity should be at least five times as large as the rated power of the inverter divided by the rated voltage of the battery. The power requirement of the loads should be the decisive factor when choosing the system voltage. The higher the power, the higher the system voltage. If no 12 V DC loads are connected to the system, a higher system voltage of 24 V or 48 V should be chosen in order to reduce the alternating currents, and thus the losses on the DC side. Inverters also generally work more effectively with a higher input voltage. All in all, a higher system voltage leads to the system having a greater efficiency, since losses are reduced. Direct currents in inverter systems are typically large. For this reason, it is important to dimension the cables between the battery and the inverter appropriately. Always connect the inverter directly to the battery. The cable you use should be as short as possible. In addition, the cable cross section should match the expected flow of current. In case of doubt, a thicker cable should be chosen. This can have a significant influence on the overall behaviour of the system. Using thick and short cables can limit losses and thus allow you to create a system with a better level of efficiency and/or better performance. If the cables on the direct current side of the inverter are included in the delivery, these should not be lengthened, and a smaller cross section should not be used.